I bought it for cycling and it is perfectly do its job as i was accepting. If you are buying for cycling go for it and gym purpose i wouldn't recommend to those who do heavy work out in gym....but if you are beginner you can try. A single star is too much for the product.Inspite of checking the reviews I bought this product trusting it would be defectless.I advice people not to waste money on this particular brand and product.The stitching was very poor,bad quality material and the foam used won't even last for more than a week. 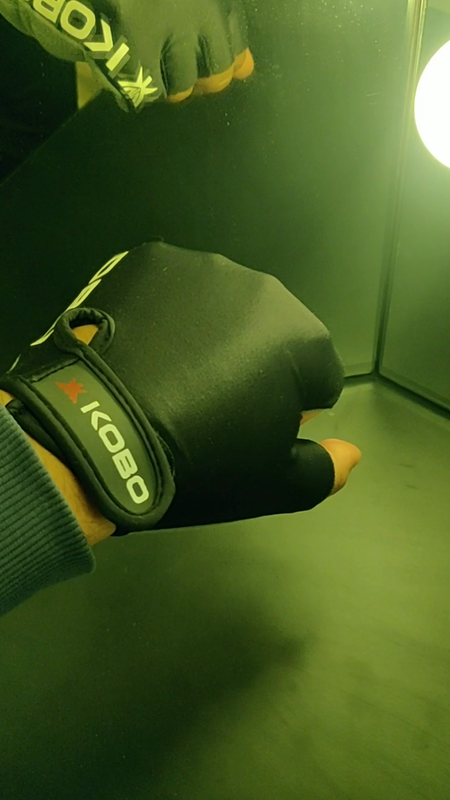 Kobo Fitness Gloves MRP.499/- purchase for INR.249/-. Good deal. Gloves are good. PROS:- 1.Good Cushion padding inside. 2.Outter gripp padding awesome. 3.Full brand looks. 4.Good for showoff. CONS:-1.Tipp of thr glovers not stitched, may get damage. 2.Not a long lasting product. 3.Upper metterial strechable synthetic, will damage by sharp things. 4.Not a worth for MRP.499. Received this product a few months back, have been using it regularly. The name is very misleading as there is absolutely no leather on the gloves. Although it is comfortable to wear, the padding is insufficient, therefore not effective enough to use. Looking for a better pair of gloves, but I'll continue to use these in the mean time. I bought it for Rs 205 and feel the product is worth that price only. I didn't have any issues with size as I followed the size chart. If you are looking for a gloves which will give you cushioning to your palms while lifting weights, then better don't buy it. It is not even going to help if you are a beginner at the gym. It is a just an ordinary gloves which has a decent look. 2. Very Light , No durability . 3. Inner Material is very cheap. 4. Used Cotton material . 5. Removing the Gloves is bit difficult. 6. Stitching is low quality , LL not support Heavy workout. One more advice if your hand size is 8 or 7.9 something so just go for the large ok it will be great . If you are beginner just go for it out also looks very much dashing. Padding is insane. The palm face is too paddy while the upper hand is too clothy due to which it gives an uneven feel of wearing it. It slides over my palm or you can say is not constantly in place on my hand. There is a series of movements while I wear it which is extremely annoying. I just bought them 2 weeks ago and the seam around the wrist has already opened. The quality is far from satisfactory and i will not recommend this product to anyone. Reasonable prices does not mean bad quality but this product has proved so. absolutely dissatisfied. The seller should replace it immediately.